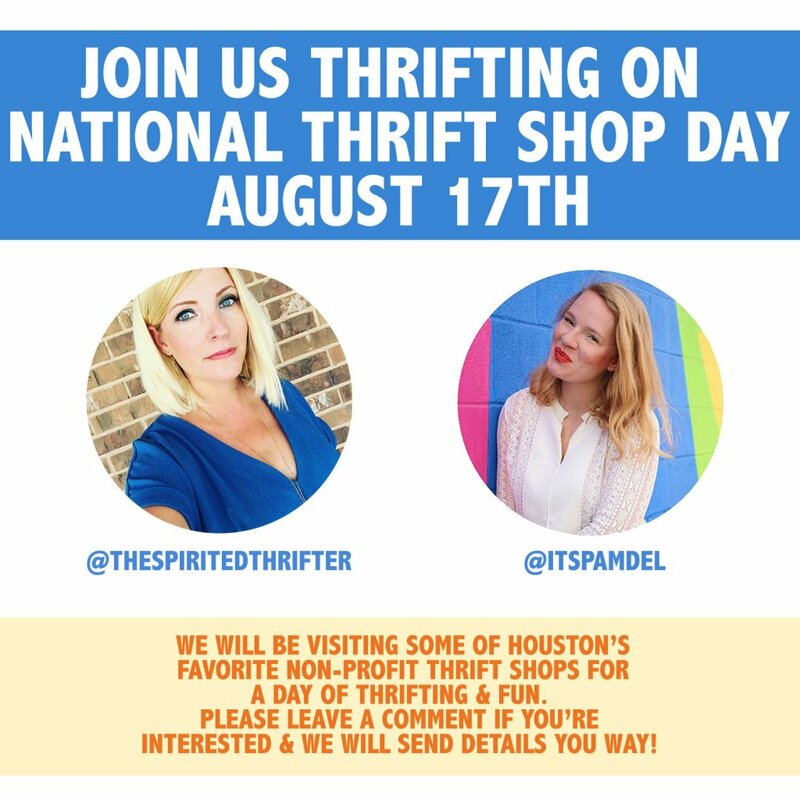 August 17th is National Thrift Shop Day and I celebrated by joining forces with Pam Dell to host a Houston Thrifters Meet Up! 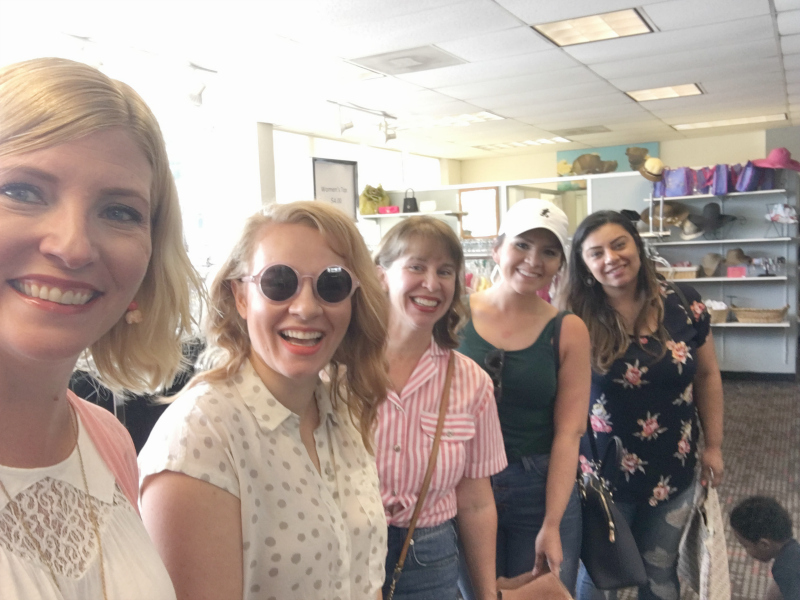 We went to two Houston non-profit “little” thrift shops then gathered for a bite to eat. I finished the day with great thrift scores, a restaurant recommendation, and new friends – so basically it was the best day ever! 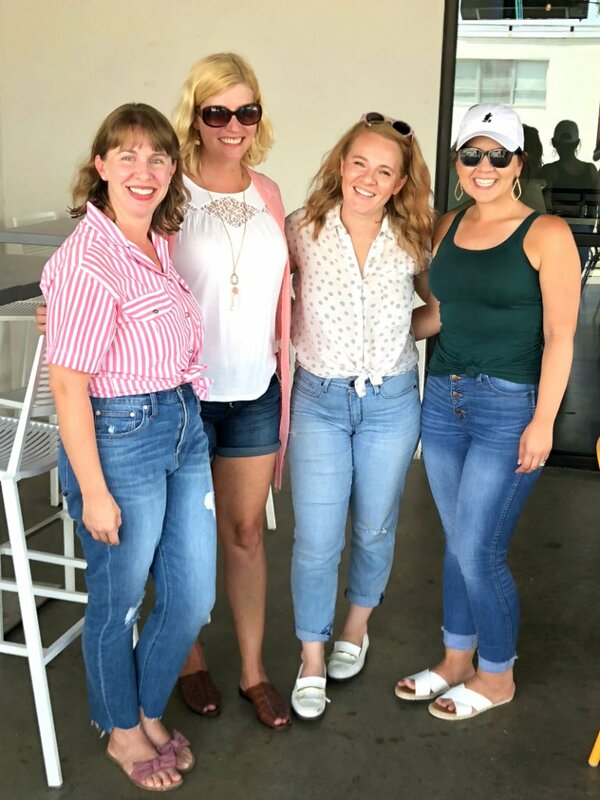 I am SO incredibly happy to connect with other thrifters in my new hometown! Plus Pam is the NICEST person AND she has great style! We started National Thrift Shop Day at The Cottage Shop, my suggestion since I have only been once before and was rushed therefore didn’t have time to properly thrift! Even though I was late, I was one of the first to arrive! I then proceeded to stare at every shopper trying to discern if they were there for the meet up! 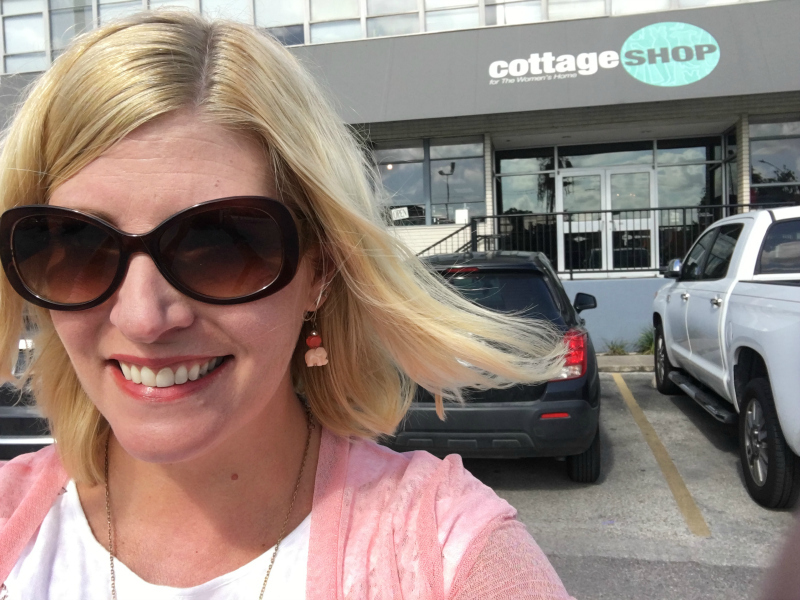 I like The Cottage Shop because of the excellent stock and great prices, but more importantly because all revenue and donations benefit the non-profit organization The Women’s Home, and it serves as a vocational training site for their clients as they reclaim their stability. Not to mention, it’s a gorgeous set-up! Shopping here is a win-win-win and the staff are SO nice! Check out my Instagram Stories highlight to see just how kindly we were welcomed – plus a fitting room sesh! Here are some shots from our time there! The first crew! Others came and went throughout the day so even if we didn’t get a photo with you, THANK YOU for coming out and being part of the Houston Thrift Community! 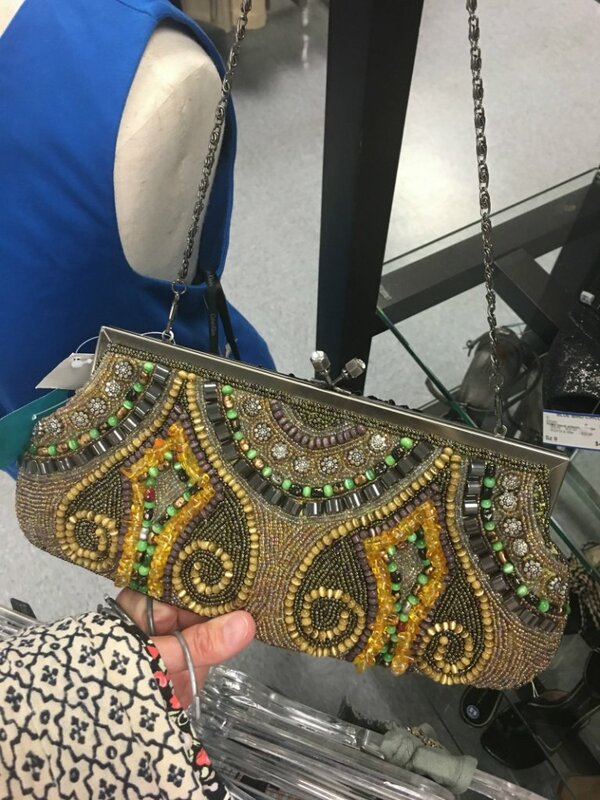 Every time I go thrifting, I pick up sheer pieces and have to tell myself to PUT THEM DOWN! 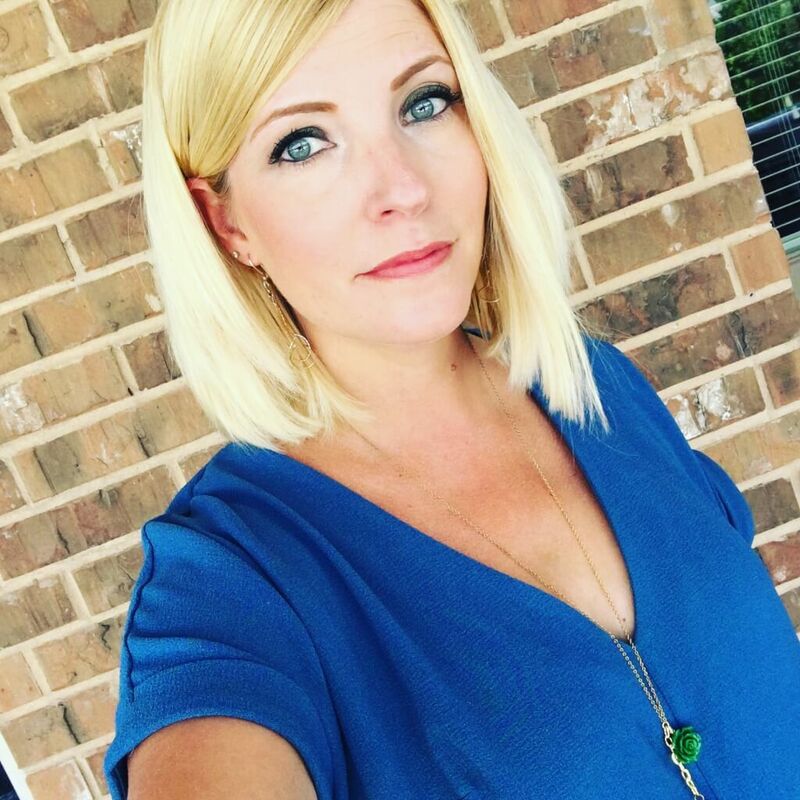 Houston is too hot for a layering tank. Loved these Givenchy shoes!!! These would retail for more than $1000!! Unfortunately, I could barely stand in them so I passed them by. I did however take home these blue sparkly Cinderella shoes for $5!! I have no idea where I will wear them. I think they are dance shoes but they are leather and in perfect condition and I had to have them for my fancy life. 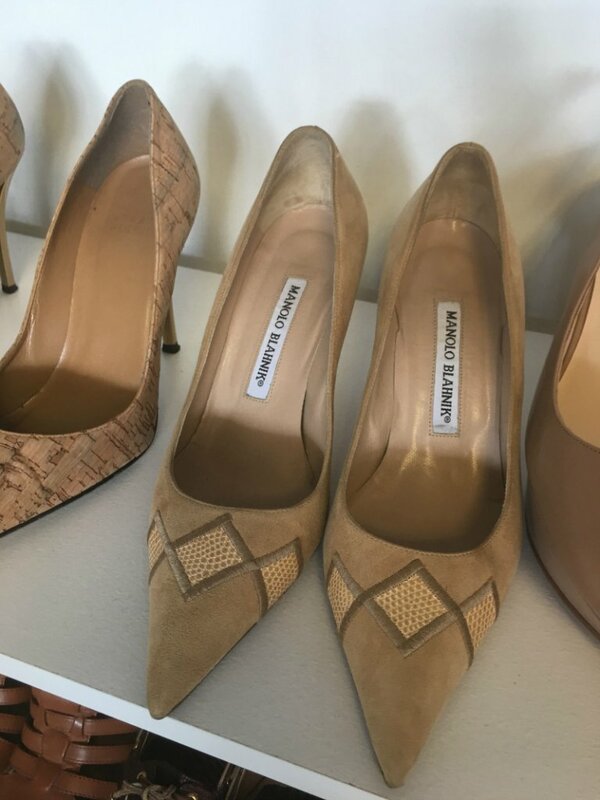 Spotted not thrifted, but good to know that you can get reasonably priced high-end designer shoes at the Cottage Shop for a great price – they have a 25% off sale on boutique items on Thursdays, making these luxe items a fab deal! 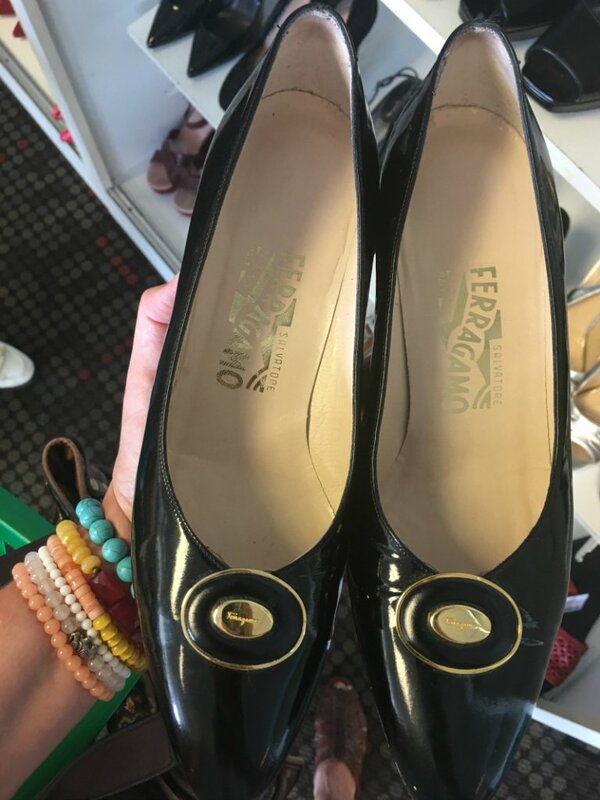 All the heart eyes for these vintage (too-small) Salvatore Ferragamos. 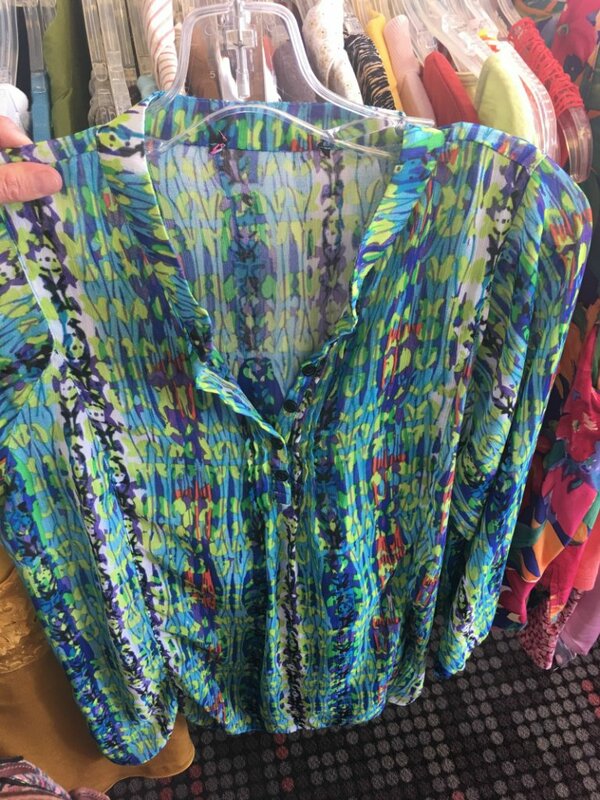 The Cottage Shop has all the usual thrift shop offerings – kids’, men’s and women’s clothing, vintage and plus sized clothing, bags and accessories, bras in new condition for a steal! 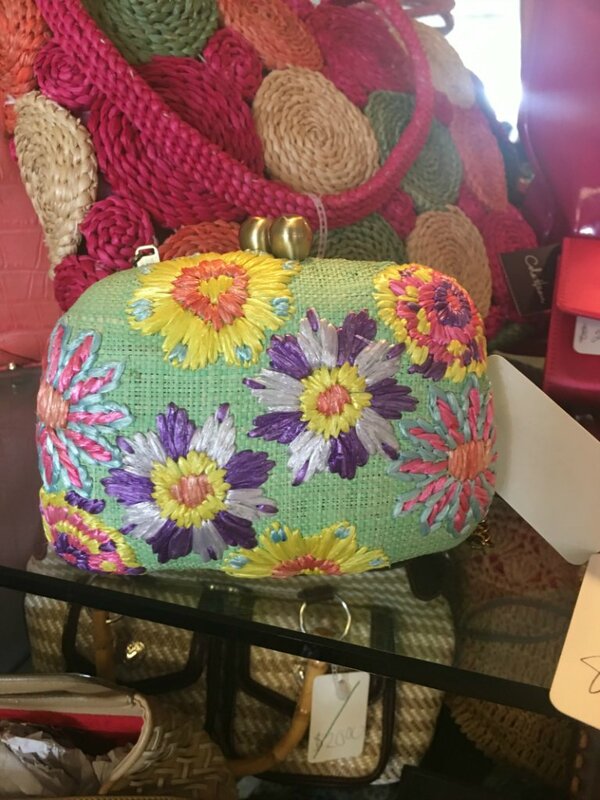 I admired but didn’t buy this straw bag! 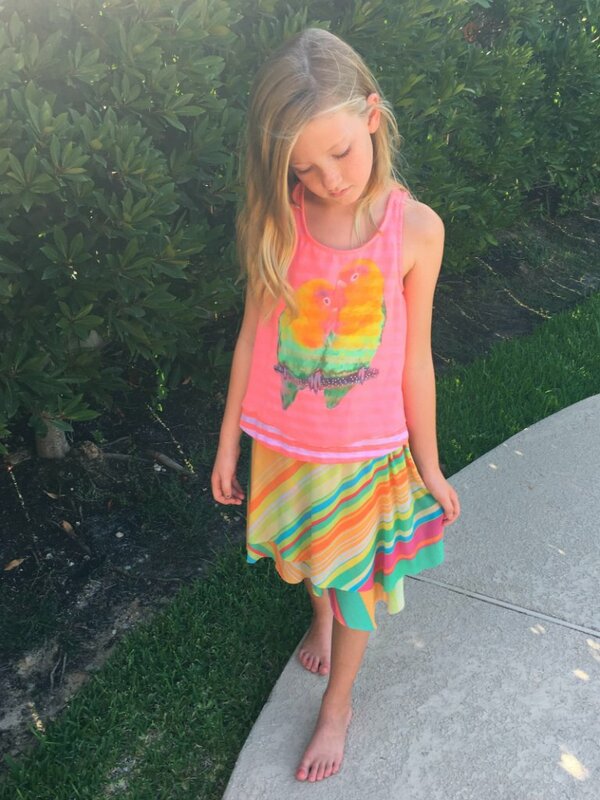 I did snag The Spirited Mini a skirt for $2.25 which she immediately put on and created an outfit with another thrifted piece that just happened to coordinate perfectly. She then struck an whimsical pose befitting of the outfit. The Cottage Shop had great housewares, art work and furniture. I scored a cute little vintage Fire King casserole in Primrose for $3! Now what to cook in it! 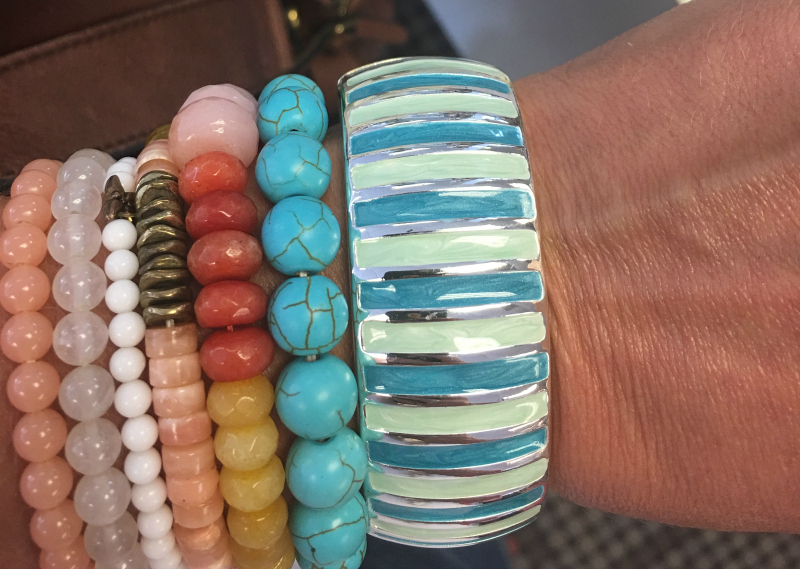 Love the hinged green and turquoise bangle for $5! 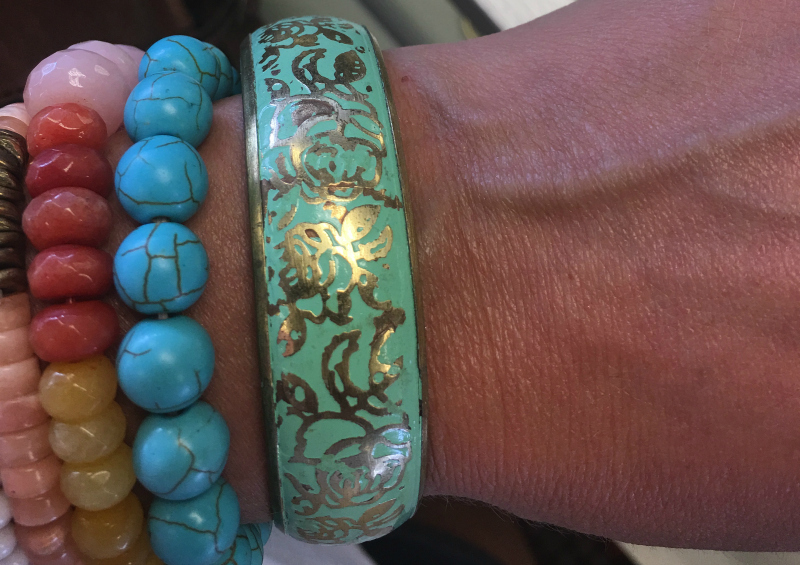 And another turquoise and gold bangle that fit my scrawny wrist! 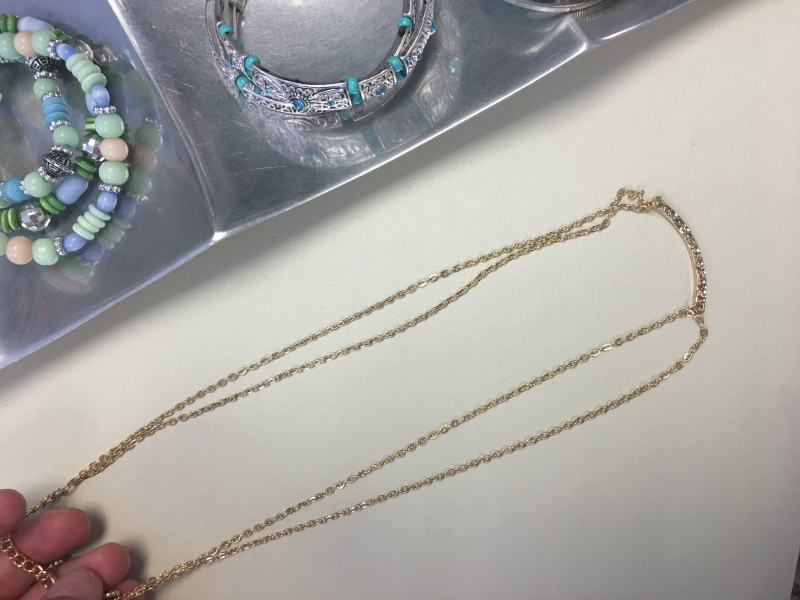 And a short simple gold necklace for $6. Jewelry is 25% off on Tuesdays! 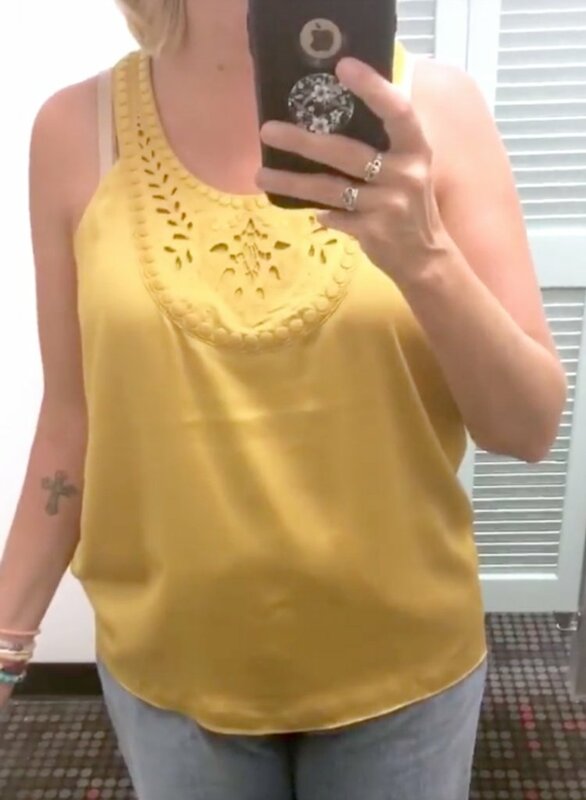 I only bought one piece of clothing which was quite tragic since I have hardly anything but this BR sleeveless top was only $3 and filled a mustard-sized hole in my wardrobe! 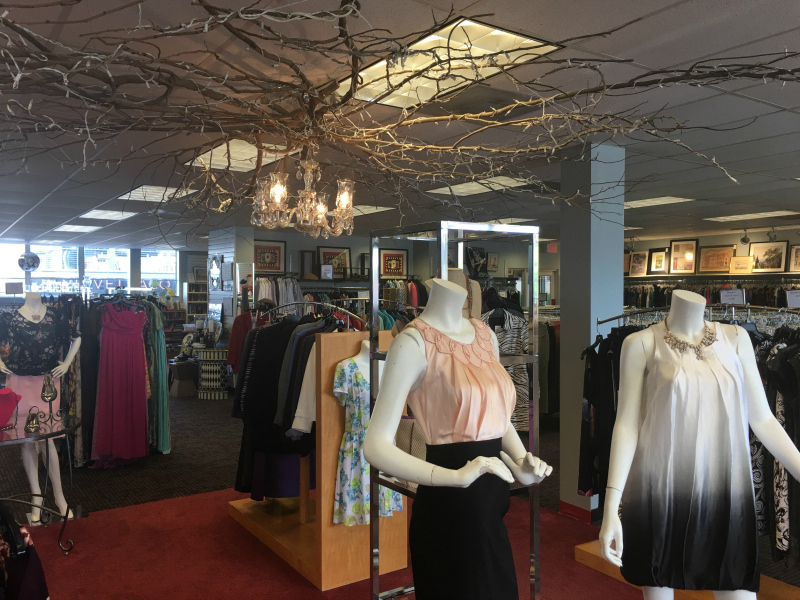 Our second stop was at the Blue Bird Circle Shop which has a great selection of clothing for men, women, and children and also a HUGE selection of furniture and housewares. 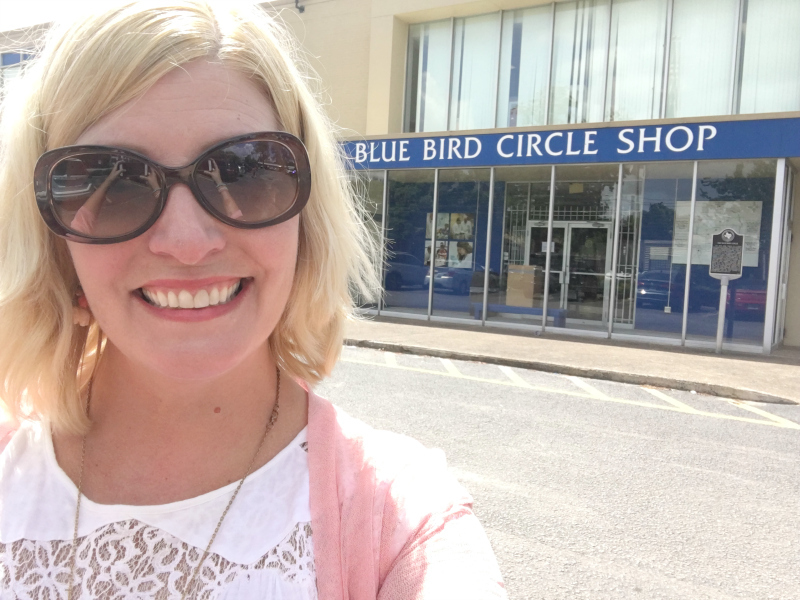 The Blue Bird Circle Shop was just a few minutes away – if you live in the area, you could easily hit a bunch of thrift stores in a day! I had forgotten that Blue Bird does pricing by date like the Guilds – not my favourite system since it means that every item is vetted and the scores are less likely BUT if you find something on the latest date, you can find amazing deals! Here are some of the pieces I spotted in the aisles and again, if you want to see some hits and misses in the fitting room, take a peek at my Instagram Stories Highlight! 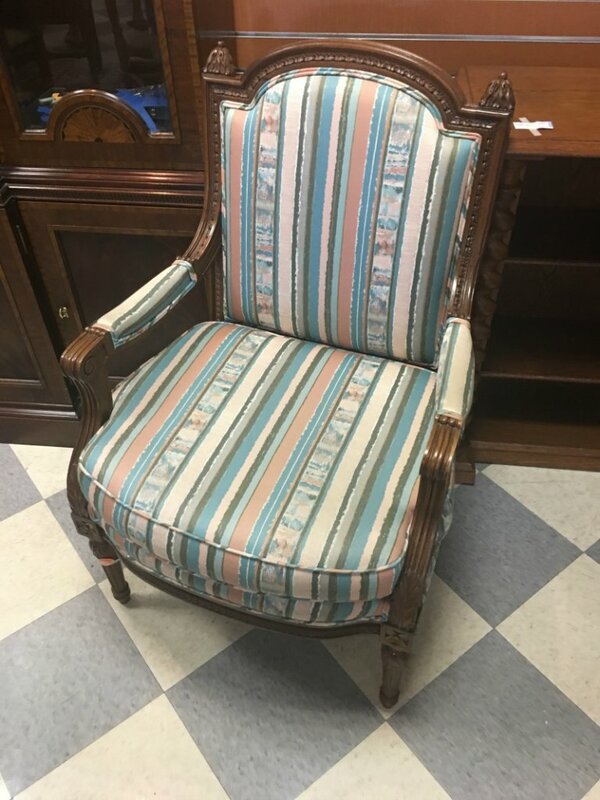 Liked this chair – I’m keeping an eye out for a bench or chair I can put in my entryway so that we Canadians can sit when we put on our shoes – that we remove when come in – when we go out! 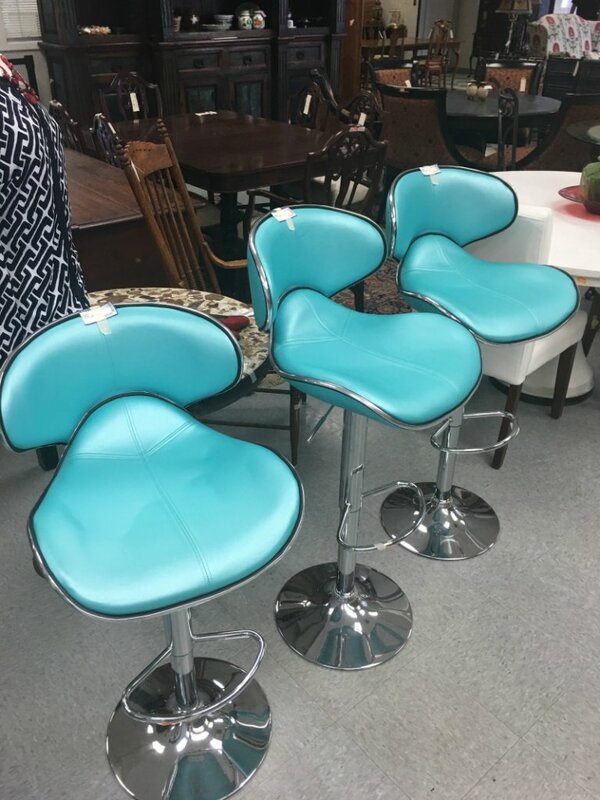 I seriously contemplated these bar stools because they match my kettle! 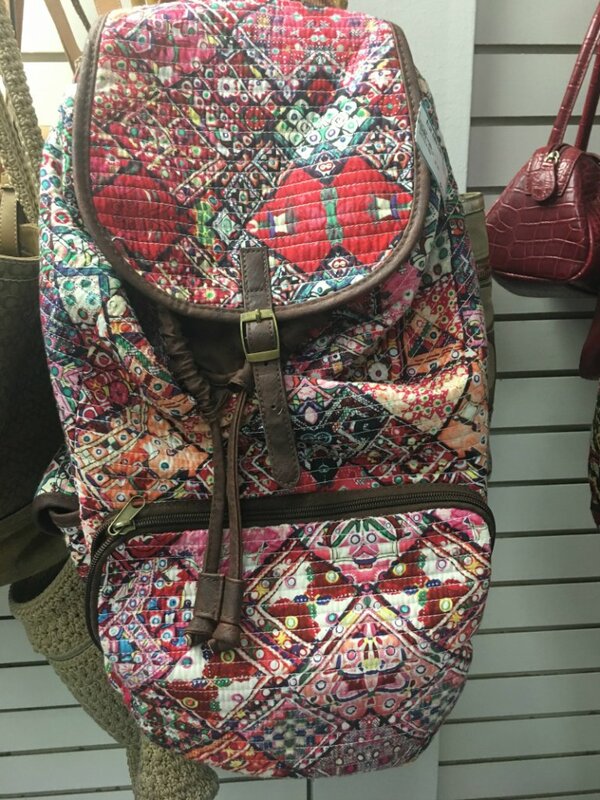 If I were a backpack-carrying-sort, I would get this one. 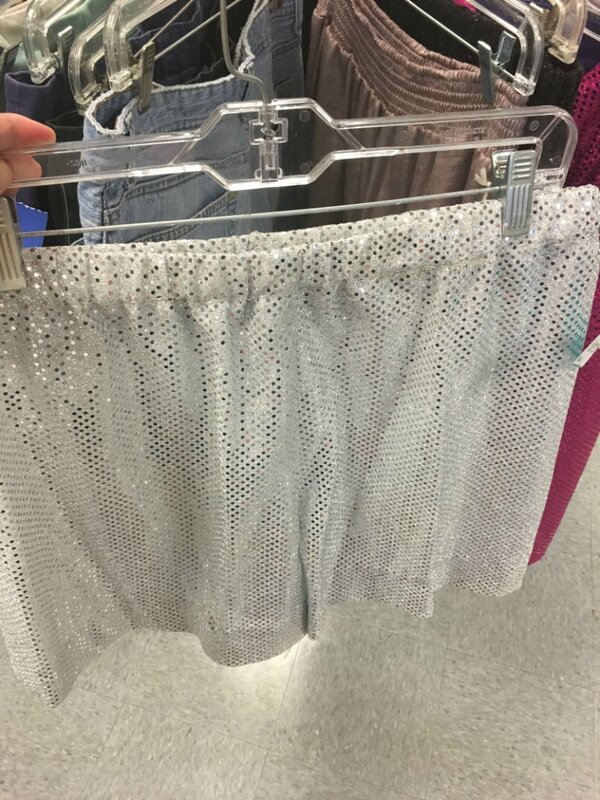 I also contemplated these sparkly shorts because they matched the shoes I got at The Cottage Shop! 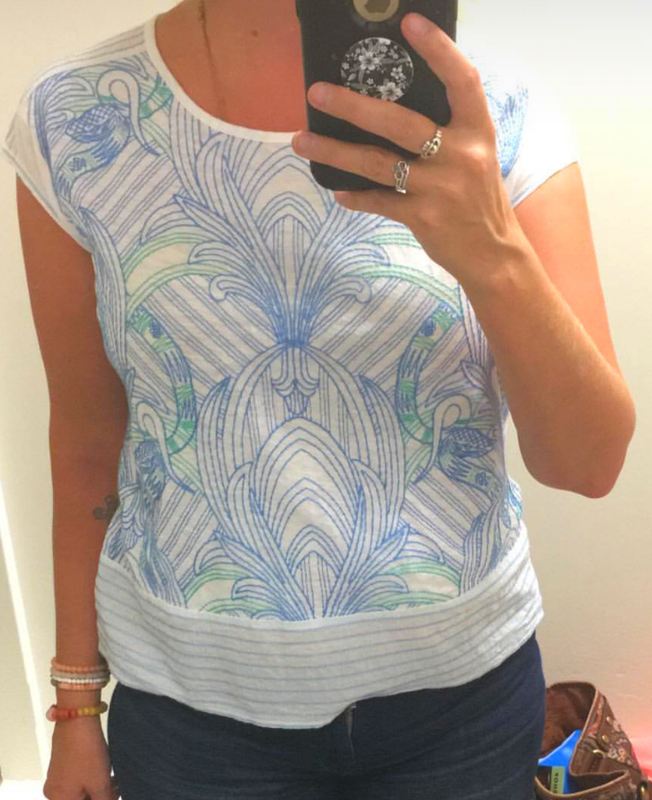 I tried on a lot of pieces but in the end, I bought only one piece – this Anthro brand Akemi + Kin top for $18 – that I found on the reject rack outside the fitting rooms. It was quite pricey but in the spirit of the day and to support their mission, I bought it anyway. I have an outfit in mind for it that I hope works!! 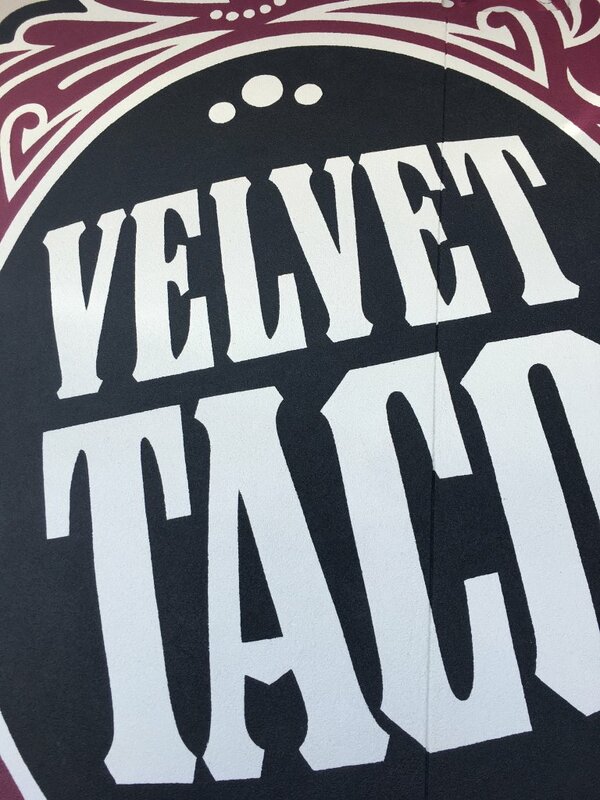 After Blue Bird Circle, we headed to Velvet Taco for lunch – delicious tacos and red velvet cake FOR THE WIN!! The margaritas looked amazing too but I resisted since I had not had breakfast and no matter how spirited you are, tequila should not be the first thing you consume in a day! Velvet Taco was delish but I basically gobbled everything up before getting a pic! This is the second year I have celebrated National Thrift Shop day in the US and I consider it a resoundingly successful day! I always do this! 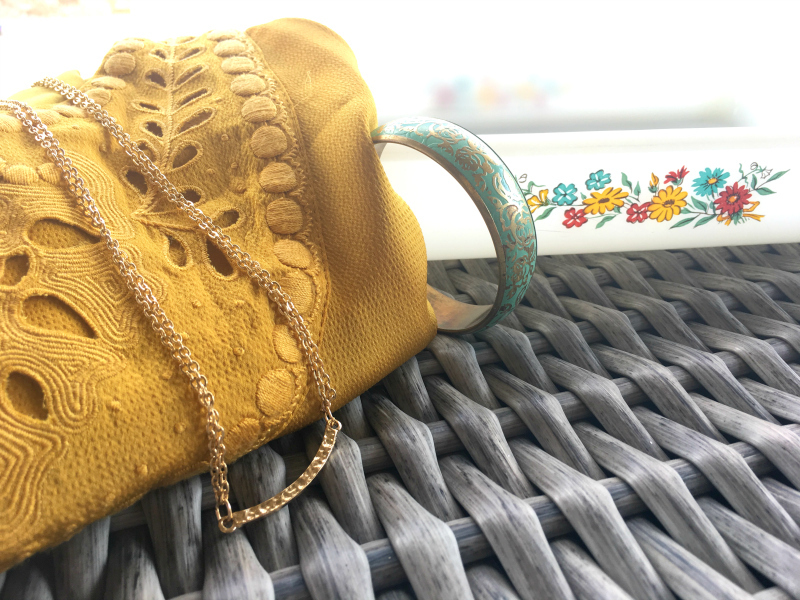 I inadvertently thrift things in themes! Thanks Pam for teaming up! Can’t wait for the next thrifters meet up! How about Y’ALL?! 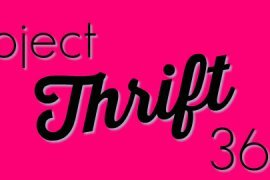 Did you go thrifting on National Thrift Shop Day? What did YOU score?! Let me know in the comments! 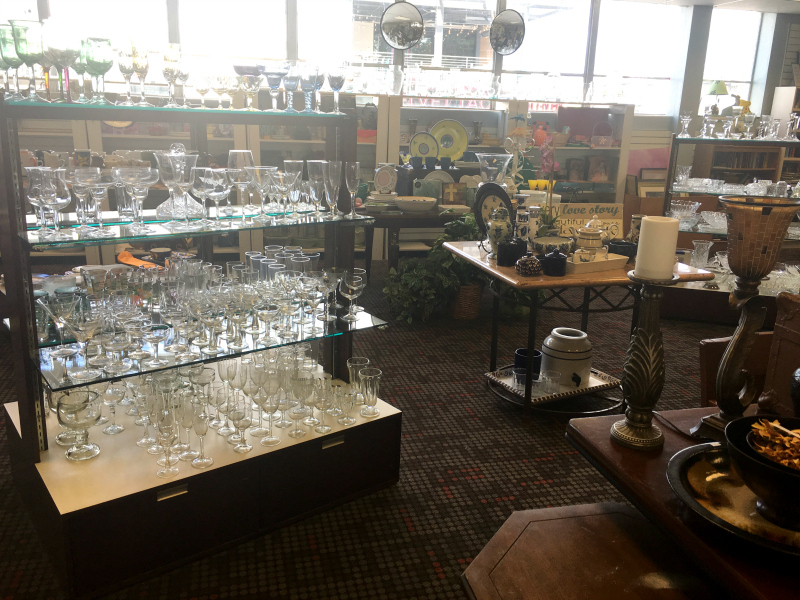 Celebrated NTD at Thrift Town in San Antonio. That store knows how to do it right: 75% off all summer clothes and 60% off yellow tags. I had been earlier in the week when the summer sale was 50% off so I focused instead on yellow tags. Thrift town offers great VIP coupons but my totals didn’t reach the magic number for the coupon to kick in. Found a couple of polos and found baskets and small containers that I’ll use for Christmas praline gifts. Okay, I need to go to San Antonio and leave some time for thrifting. We have Sea World passes and have seen the River Walk and the Alamo so it’s time for some of my thing!! Sorry to hear about your thrift regret! That’s what I don’t like about the Houston thrift stores with tiered pricing by date – if you wait for the better price, you might lose out. I know that’s the point BUT STILL!! I have never been to Thrift Town. Can’t wait to go one day! Thanks for the comment! That is so great that you’ve all met for a thrifting and food adventure! So exciting! I love that Anthro top and the mustard BR one. Thank you!! It is pretty fun to meet up with other thrifters! Kindred spirits!